Overview: Things aren’t looking great: your spaceship is taking fire, systems are offline, and the captain is out of commission. It’s up to the crew to get the shields back up and start the hyperdrive — but don’t forget about the life support systems! Oh, and did I mention that you’re still taking damage? Damage Report is a real-time cooperative sci-fi game, seeking funding on Kickstarter until Monday, October 8. Damage Report first showed up as a print-and-play reward in Break From Reality Games’ first Kickstarter project, Disaster Looms . I’ve been excited about it since then, and the easy scenario they demoed at PAX Prime really hooked me. BFRG sent me a prototype to get a better hands-on look at the full game, and it’s definitely worth backing. Rating: Intensely fun, and a bit chaotic. Who Will Like It? Sci-fi fans will appreciate the feeling of being on a spaceship, running around and trying to fix things. If you like cooperative games but don’t like the “alpha player” problem that sometimes arises, the real-time nature of this game prevents that. Everyone has to take some initiative, or you’ll all die horribly. In space. Where nobody can hear — you get the picture. 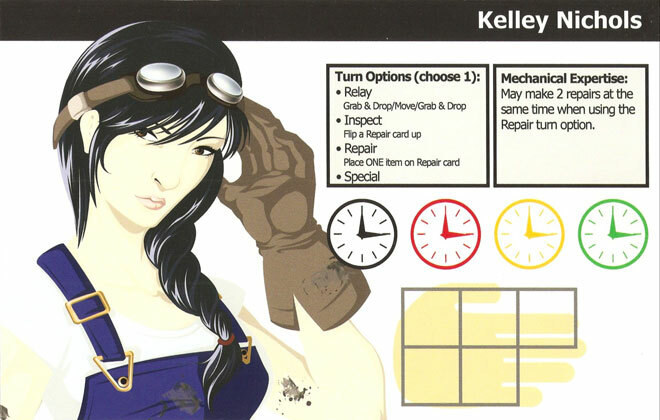 Kelley Nichols, the mechanic, can place two repairs in one action. The gameplay does capture the theme of the game, to a point. You’re all running around the ship trying to hastily repair things, but nobody is really in charge (remember, the captain is badly injured) so everyone has to pitch in. Because there’s a timer that determines when damage occurs, you don’t have time to pause and overthink things or really spend a lot of time in discussion — if you’re not acting, you’re losing time. Of course, this being a game, there have to be some limitations that might strain your suspension of disbelief. As life support drops, it takes you longer and longer to do an action, which seems realistic; but the way that translates to gameplay is that you sit there with your hands tied until your sand timer hits the right spot. It can seem like a “hurry up and wait” game at those times; you know what needs to be done but you can’t do anything about it. And, of course, anyone can fix anything with the right combination of tools and four types of resources — not entirely realistic, but no different than building a settlement out of brick, wheat, wood, and wool. Currently, thanks to the overfunding goals on Kickstarter, the Attack timer has been upgraded to a digital timer instead of a sand timer (which is nice, because in the middle of a game not everyone’s going to notice when the sand runs out). Also, the Crystals and Energy have both been upgraded to plastic components. The Circuits and Metal are both cardboard bits, as are the tools, though there’s a stretch goal for getting molded plastic tools at a higher reward level. The prototype I played with had cardstock components for the tools and some resources, and those could be a little hard to pick up in a hurry, but cardboard chits should work just fine. 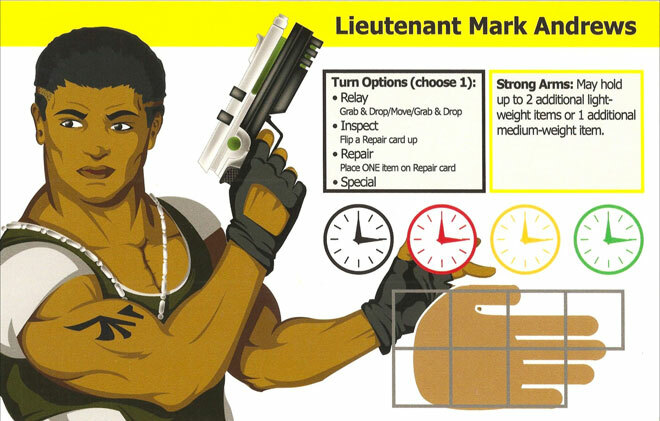 The player boards (you can see Kelly Nichols above and Lieutenant Mark Andrews below) list the possible actions and special powers, as well as a few important icons. The clock icons (or gears on Lynkon the robot) are for the sand timer as it moves from one to the next, indicating when you get your move. The hand icon shows how many things the character can carry at one time — for most, there are five small squares which fit smaller resources; tools and sheet metal require two of the squares. Mark Andrews can carry more, but Professor Frank Barber has small hands and only has room for four small items. The artwork is fine but not spectacular; vector drawings get the idea across without being too detailed — but when you’re rushing around the spaceship you don’t have time for details anyway. The one thing I might change is that the black background on the Attack cards (see image below) can make some of the dark icons like the blue shield hard to see. Might be nice to balance those out a little better. If you want to see an early draft of the rules, you can download that here. The game has different scenarios, each showing a particular configuration of ship modules and intended for a particular number of players. Each scenario has its own game winning conditions and a variety of game losing conditions. Because of the real-time nature of the game, you can set a hard limit on how long the game will last — if you don’t win before the time runs out, then either your ship goes down or you reach the Game Over card at the bottom of the deck. After selecting a scenario, you lay out the ship as pictured and place all the resource tokens next to the corresponding supply modules. The Repair decks are placed on the “draw” area of their corresponding modules, and damage markers are placed on the spaces marked in purple: Life Support at 80%, Hyperdrive at 0%, and so on. The Attack deck consists of 14 randomly-chosen Attack cards, shuffled together, and then the Game Over card placed at the bottom of the deck. There’s also a Ship Hull card, which starts at 100%. Some scenarios will have additional instructions about setup. Each player chooses a character and takes their player board. 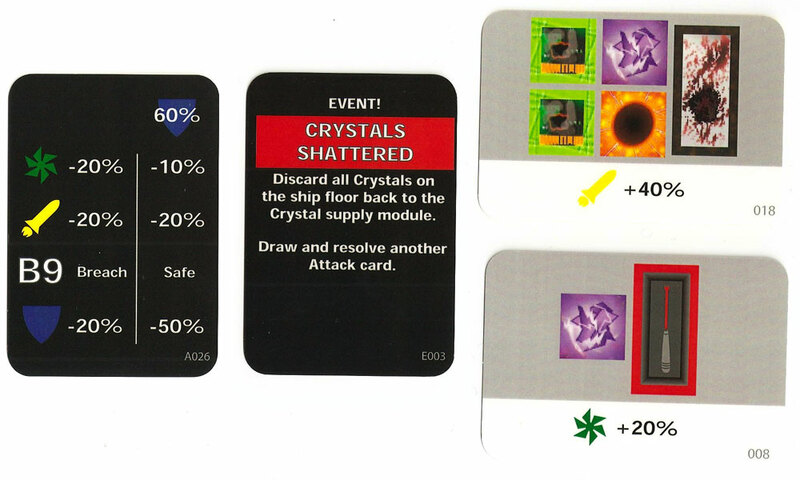 The Module cards are shuffled and players draw cards to see where on the ship they will start, and then place their player tokens on the ship. Once everyone is in place, the 3-minute Attack timer is started, and the game begins. The key mechanic of the game is in the sand timers which tell you when you can take an action. The Life Support damage meter has areas that are green, yellow, red, and black. When your turn begins, you check the Life Support status and start your timer on the corresponding color on your board. When it runs out (15 seconds), then you flip it over and place it on the next timer to the right. Once it hits the green and runs out, you get to take an action, and then the timer will go back to whatever the Life Support status shows again. This simulates lowered oxygen levels in the ship, which make it harder to breathe, slowing people down. When the Life Support is on green, everyone gets one action every 15 seconds. But if it gets damaged too much, you may find yourself limited to one action per minute instead. Everyone is acting at the same time, and keeping track of their own timers. Your available actions are: Relay, Inspect, Repair, and Special. Relay is basically moving from one module to the next, but incorporates the Grab & Drop. You can grab and drop any number of items in your starting room before you move (keeping to your hand’s limit) and then grab and drop any number of items in your destination once you get there. Inspect is flipping the top card of the Repair deck in your current module. The Repair cards show some combination of resources and supplies needed to repair that module, as well as the percentage it will fix that system. You can only Inspect if a module is below 100% and doesn’t have a Repair card already showing. Repair allows you to place one item from your hand onto its matching spot on a Repair card. Once placed, it cannot be removed until the repair is done, and you cannot put an item into a repair slot as part of the “Relay” action. When a Repair card is filled, then the damage meter is adjusted by the amount shown on the card. Any tools used in the repair are put on the floor of the module, and any resources used get returned to the supply, and then the card is discarded. Special actions depend on the characters’ abilities and the modules. For instance, the alien Lobo has a psychic ability which lets her flip over the next Repair card to see what will be needed in the future. 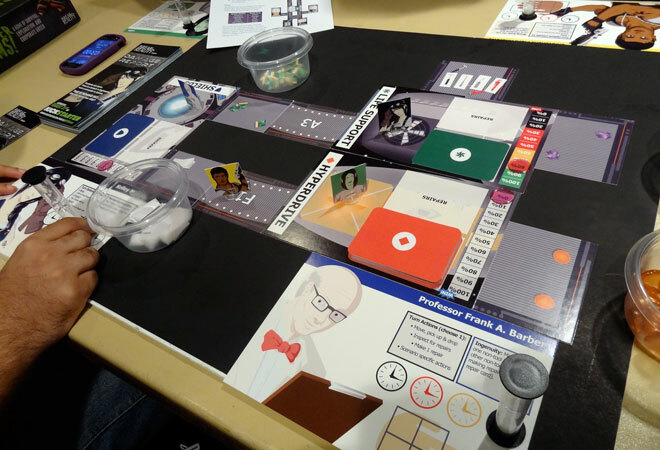 Dr. Monica Boyd can heal a player in the same module, removing injury tokens from their card. The Teleport module will let you send resources and tools around the ship. When the Attack timer goes off, then the top card of the Attack deck is flipped over. There are two columns, and one has a shield number at the top: if your shields are at this level or higher, then the shields absorb much of the damage and you use this column. Otherwise, you use the other column (which generally results in a lot more damage). Sometimes there are hull breaches in certain corridors — those cards get flipped over, and there are repair icons shown on the back. In a breached corridor, Life Support is at 10% while you’re in there, so you move very slowly until it gets repaired. Also, if you’re in a corridor when it gets breached, you lose all the items you’re carrying and fill your hand icon with injury tokens — you’ll have to get to the infirmary (or find Dr. Boyd) to get rid of those injuries so you can carry things again. If an Attack damages the Shields and they’re already at 0%, then it damages the Ship Hull by 25% instead, so you can only take four hits this way before your ship blows up. Also, if a corridor breach occurs in a corridor that’s already damaged, you take Ship Hull damage. To win, you have to fulfill the objectives before you all die: it might be repairing the Hyperdrive to 100% to get out of there, or destroying the Xelan ship before it blows you up. One scenario involves using the small fighter ships to clear away asteroids before you take off. At any rate, if your ship hull or Life Support ever go to 0%, you lose; you also lose if you flip over the last Attack card, which says “Game Over.” The specific scenarios also have other losing conditions. If you find the game is too easy (we didn’t), you can add in various rules to make it harder, such as taking injuries when you’re in a damaged module, shuffling in some of the nasty Event cards to the Attack deck, or decreasing the starting levels on some of the damage meters. Lynkon (robot): doesn’t need Life Support, and always starts timer on yellow; can control some modules remotely. Mini scenario at PAX Prime. As much as I like playing competitive games, it’s nice to play something cooperative from time to time, particularly when you’re playing board games with your kids. It relieves some of that tension between going easy on them and wanting them to really learn the strategy. Co-op games can also be great for new players and casual gamers, people who want to give something a shot but want some guidance as they learn the game. Castle Panic , Flash Point: Fire Rescue , and Forbidden Island are all fun examples of kid-friendly co-op games. However, one of the biggest downsides to co-op games is the alpha player — the person who knows the game well, has a definite plan, and isn’t afraid to speak up. When that happens, a co-op game turns into something like solitaire, with everyone else doing one person’s bidding. When I spoke to the guys from Break From Reality Games, they said that they’re actually not fond of co-op games in general, precisely for that alpha player problem, so their game is intended to counteract that. Having played a few times, I can tell you that Damage Report does just that. With Damage Report , you really do feel like a ship without a captain — nobody is “in charge,” and if somebody tries to micromanage everyone else, they won’t be able to keep track of their own timer and they’ll fall behind in the actions they could be taking. It’s also quite hard: in one scenario, you can win either by shooting the alien attackers four times, or by repairing your Hyperdrive to 100% to get away. But we discovered — too late — that you really can’t try to do both. You’ll need to pick one early on and go with it, or else you’re spread too thin. At the same time, you still have to keep track of your Life Support and Shields. It’s a fun game and I’ve really enjoyed playing it. Even when we got some of the rules wrong the first time and ended up with a really long game (used all of the Attack cards rather than 14) before finally biting the dust, we were engaged and I was having fun. It can be stressful, though, so if you’re looking for a nice, relaxing game where you can cogitate a bit, this is not it. Although even at your fastest pace you can only do one action every 15 seconds, once things get going you’ll find that it’s barely enough time to coordinate a strategy without slowing things down. Thematically, I think the timing is okay: it’s a big spaceship, and so it takes you a full minute to run through a module to the other side (while picking up and grabbing things) when the oxygen levels are low. As a game, though, it can be excruciating to sit for a full minute while you watch the Attack timer ticking down, because you’re just sitting there. It’s one of those things where if you were playing a video game and your character was moving, but very slowly, it would feel like you’re going somewhere slowly, rather than sitting for a minute, popping into the next room, and then sitting for another minute. I’m not sure that there’s any real solution to that, but maybe it helps to think about your character stumbling down a long steel corridor rather than just standing still. With the different scenarios and optional rules, there’s a high replay factor. And I’m sure it won’t be long before people come up with their own ship layouts and scenarios. I think the current setups are probably a bit too difficult for my kids, but I can see coming up with simpler ships or maybe a handicapped Life Support damage meter to get them in on the game, too. A few things: you’ll definitely want a large table for this. As you can see from the photo at the very top, we barely fit a four-player game on my round table. With six players we’d be sitting pretty tight (or maybe standing). Another thing is that I imagine there would be a big difference in just having one more person on the team — that’s another set of actions to go around, and another special ability. The draft rulebook I have just has two scenarios in it — one for 4-6 players and one for 5-6 players. The difficulty level doesn’t necessarily scale when you add more players, so the more people you have the more easily you’ll be able to survive. It will probably be more a question of selecting the right scenario to get the right difficulty level — perhaps this can be tuned with variable setups based on the number of players. Overall, Damage Report is a great game. The people who will enjoy it the most are sci-fi fans who like a high-intensity experience. If you haven’t really enjoyed co-op games because you feel one player tends to take over, Damage Report is worth trying for that real-time action. I think there are a few kinks to work out, but I’ve already backed it myself and I’m considering bumping myself up to the Gamer’s Pack level because I really want to see those extras. Check out the Kickstarter page for Damage Report for more! 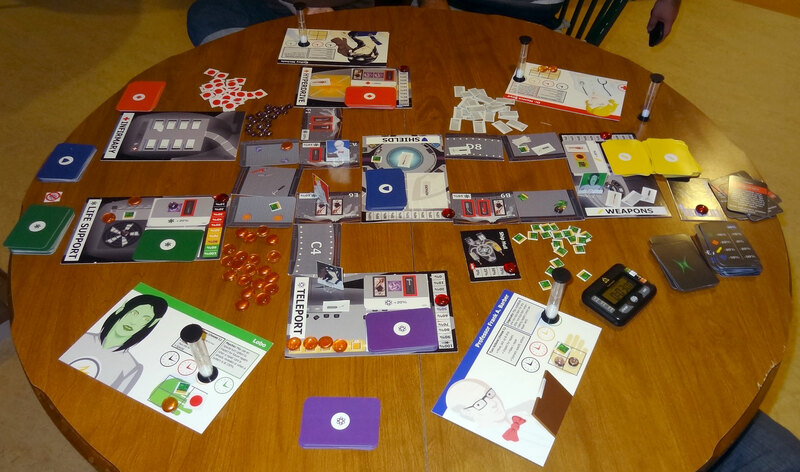 And if you missed out on Disaster Looms!, you can add copies of that to your Kickstarter pledge as a la carte items. Wired: Real-time co-op action prevents any player from taking over; intense gameplay while that timer keeps ticking down to the next attack. The game ends in 45 minutes tops, whether you win or lose. Tired: When life support is low, you’ll do a lot of sitting.